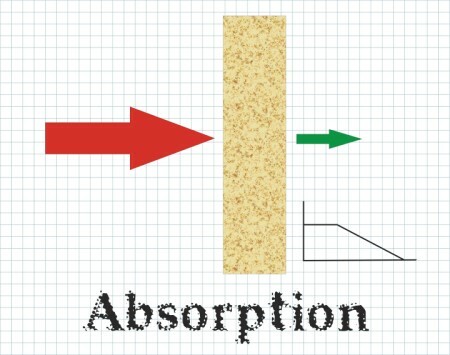 The first acoustical building block is absorption. This is the best known, and hence the most misapplied, acoustical tool. “Misapplied”, because there is a widespread misconception that the use of a lot of absorption will make a room sound “good”, and keep the sound from intruding into another room. This situation usually starts with someone spending a lot of money to corner the fiberglass market, and ends up with a dull sounding room. (And very little, if any, sound isolation to show for it, by the way.) Nope, wrong. What absorption does is reduce acoustical energy in a space; it does not spread sound around, a major component for obtaining a “good” sound in a room. That’s done by diffusion. And absorption does not block sound, which would be acoustical isolation. Absorption just turns down the spigot. But the acoustical spigot acts more like a leaky faucet. You can reduce the drip by cranking down harder on the handle, but you can’t completely stop the flow. And as you crank down harder and harder, there is less and less reduction of the leak; more work brings smaller benefits. The law of diminishing returns applies here. This is why absorption is also not the right tool for reducing sound intrusion into or out of a room. It may reduce the problem, but it’s not a solution. And while you’re sucking all this energy out of the air, it’s getting harder to hear your speakers. So you turn things up, replacing the energy you just removed with more. Does this sound like you’re spinning your wheels? And while absorption will reduce the amplitude of those pesky early reflections that damage sonic quality and localization, it doesn’t break them up. That’s another job for diffusion, which is much more adept at curing the problems that early reflections bring. So among the many types of absorbers, the most practical are resistive and resonant. And one obscure fact about all absorbers is that they’re frequency dependent, which makes them trickier to use than one may think. For resistive absorbers (like fiberglass and foam products), the thickness of the absorber determines the lowest frequency it will absorb, acting just like a low pass filter. The thickness is considered to be ¼ wavelength of the lowest frequency absorbed. You can use a thicker absorber or space it out from the wall to lower the roll off frequency, but at some lower frequency it will still stop absorbing energy. This also means for very low frequencies you need A LOT of depth. But physics comes to the rescue with another type of absorber. Resonant absorbers are also frequency dependent, acting on a specific frequency band rather than as a low pass filter. And they accommodate low frequencies without the depth you’d need in a resistive absorber. You can tune a resonant absorber to a particular frequency by changing any of the various dimensions (width, length, depth, port size, port depth, etc.). Helmholtz resonators and panel resonators are examples of this kind of absorber. I use resonant absorbers to control low frequencies. A typical application would be to tame an extended low frequency decay, which can turn up around the various resonant frequencies of the room. But this frequency dependency also makes absorbers a flexible tool as well. You can easily tailor these absorbers to specifically address the particular problems in a room, like the long low frequency decays above, rather than applying it as a general treatment. You can also combine resistive absorbers with resonant absorbers to reduce the RT60 (the time it takes sound to decay 60 dB) of a room across the entire frequency spectrum with a minimum amount of coloration. Very handy and useful, once you know about it. So you can now see why absorption is not the cure-all that it’s commonly thought to be, but a tool to help you get improved acoustic performance from your room. Use it in conjunction with the other tools to attain the best acoustic performance in a sonically sensitive space. Use it wisely and prosper. Next tool – acoustical isolation! (cue the Supremes – “STOP! In the name of sound, before I break your neck”). Over time I have found that there is a general lack of understanding of acoustics. Even among some sound professionals, it is viewed as a sort of black art. Those who understand it might be viewed as people who have sold their afterlife to some malevolent deity in return for understanding The Secrets. So what I want to do is provide articles that demystify acoustics, dispel myths, and even provide tips and things that you can use to improve the sound in the rooms where you work, record and listen to music, and watch movies. Don’t worry about the math – there won’t be any unless you really want it. But you’ll have to ask. In acoustics, there are four primary elements used to control what happens sonically in a room. 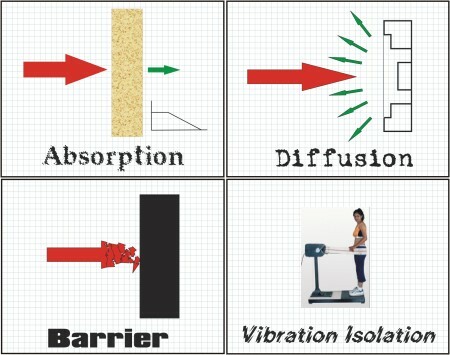 They are absorption, diffusion, barrier, and vibration isolation. Absorption is the best known and the most misused, usually by going to the local home center and buying a bunch of fluffy fiberglass to “soundproof” a room. Technically, there is no such thing as “soundproofing”, and the fluffy stuff wouldn’t do it even if there were. Diffusion takes what are called specular or hard reflections (“angle of incidence equals angle of reflection”), and spreads the sonic energy in different directions. Barrier is used to contain sound and prevent it from intruding into other spaces. This is the element that allows multiple adjacent rooms to exhibit movies at a multiplex, assuming the builders used it. The last element is vibration isolation. This keeps sonic energy, particularly powerful low frequency sound, from getting into a building’s structure and using that as a path to intrude into other rooms where the sound may not be welcome. Once you understand these elements, what they are and how to use them, you’ll have the knowledge to make your edit room, studio, or home theater a really nice listening space. So watch for the next blog, where I’ll discuss the first element, Absorption. Yesterday we lost one of the biggest names in pro audio in the Los Angeles area and beyond. He will be remembered for the numerous contributions he made to our industry. Read about him at http://mixonline.com/news/drew_daniels_obituary_0212/ . I sent a press release to the Motion Pictures Editors Guild Magazine about the free gobo design. Editor Tomm Carroll got back to me asking if I could write an article for their tech tip column about this. I of course answered “yes”. So in the January/February 2011 issue, due out the last week of December, there will be a tech tip on the gobo, including construction tips, and information on how to figure out where to place them for the best performance. I’ll put a link here on the blog as soon as I have one to post. It’s good, informative reading for the quiet time (at least work-wise) between Christmas and New Year’s. I have recently completed the design for a new “super gobo” for recording studios and post production sound. Usually gobos have an absorbent side and and a hard, reflective side. This super gobo, however, has a high performance diffusor on one side, and an absorber on the other. With casters on the bottom, you have a gobo that provides adjustable room acoustics that can be used for more than just adding some isolation to musicians. By exposing either the absorptive or diffusive side, and moving the gobo into different positions, you can experiment and optimize the acoustical signature of your room at will. Sound editors can also use these to add very effective acoustical treatments to their workspace. Often times these are rooms like small offices or spare bedrooms, which were never designed with sound in mind. And having casters on the bottom makes it easy to change between exposing the diffusor and the absorber, and adjust gobo angles for the best sonic performance. Another advantage is, should you move to another workspace, the casters on the free-standing gobos make it very easy to move your investment in acoustical treatment to your next room. Nothing gets left behind. The plans are free for any one to use for personal use, and are available as a pdf download at http://www.mediaroomstech.com. So what am I trying to do with this? I’ve spent over 25 years in post production sound engineering, and over that time I’ve found that acoustics is considered to be like a black art that is understood only by those who have sold their afterlife to some evil deity in return for “the secret knowledge”. As a result, a great many people working in things that acoustics touches upon have misconceptions about it, relying on what they heard from someone else, who heard it from “someone who should know”, who heard it from, well, you get the point. What I want to accomplish with this blog is to replace hearsay and myth with good, reliable information that will help you understand acoustics and put that knowledge to use in your particular situation. From a home theater or listening room, to sound editing rooms and full-on film and TV mix stages, to music recording, to screening theaters and beyond, I want to show you how to make your sonic experience better. I want to give you the knowledge to take acoustics from scary black magic to the understandable mix of science and art that it is.